First up, if you haven’t read the review of the MindShift Rotation 180 Professional, you might want to start here. Mindshift Gear make a few different padded inserts to suit their different backpacks. 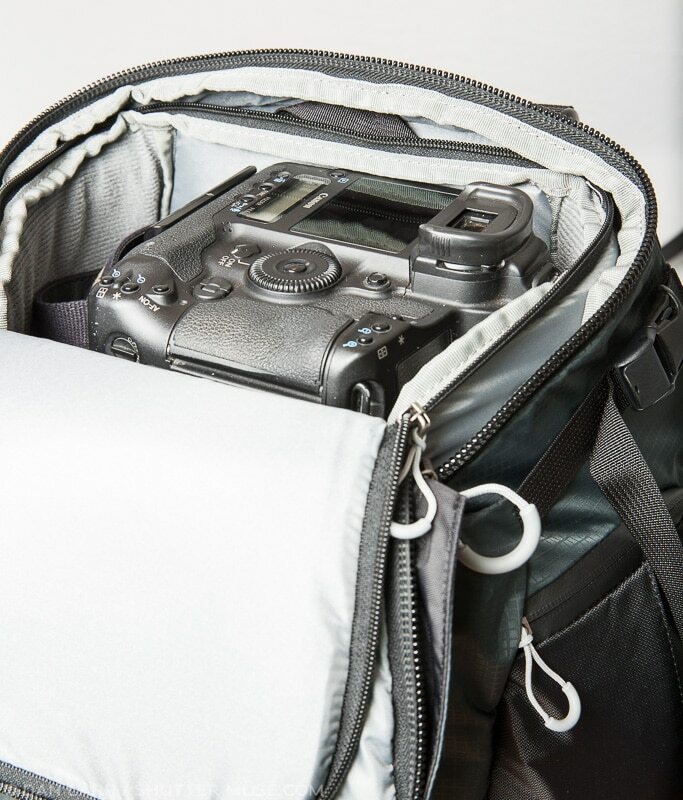 This is the Professional Padded Insert which is designed to compliment the Rotation 180 photography backpack. Additionally there is a Panorama Padded Insert which, as the name suggests, compliments the smaller Panorama backpack. You can buy the Rotation 180 as a ‘Standard edition’ for $399 which does not include this padded insert, or you can buy the ‘Deluxe edition’ for $499 which does include the padded insert as well as the Top Pocket, Tripod Suspension Kit and extra attachment straps. 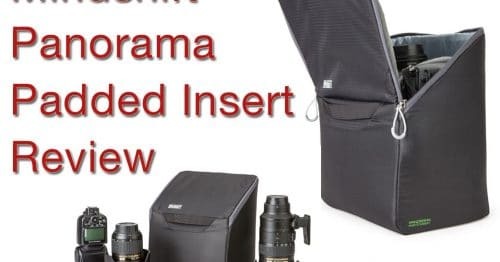 For those that feel like they don’t want those extra pieces (all detailed in my other Mindshift Gear reviews), you can pick up this Professional Padded Insert for $59.99 thereby saving you $40 over the price of the ‘Deluxe edition’. My choice? Well personally if I’m in for $460 for a camera bag I might as well be in for $499 and get all the goodies. If you read my reviews of those other accessories you’ll see they can be very useful and there is a good saving to be had over buying them all individually; I’d take the ‘Deluxe edition‘ and be done with it. Your mileage may vary. 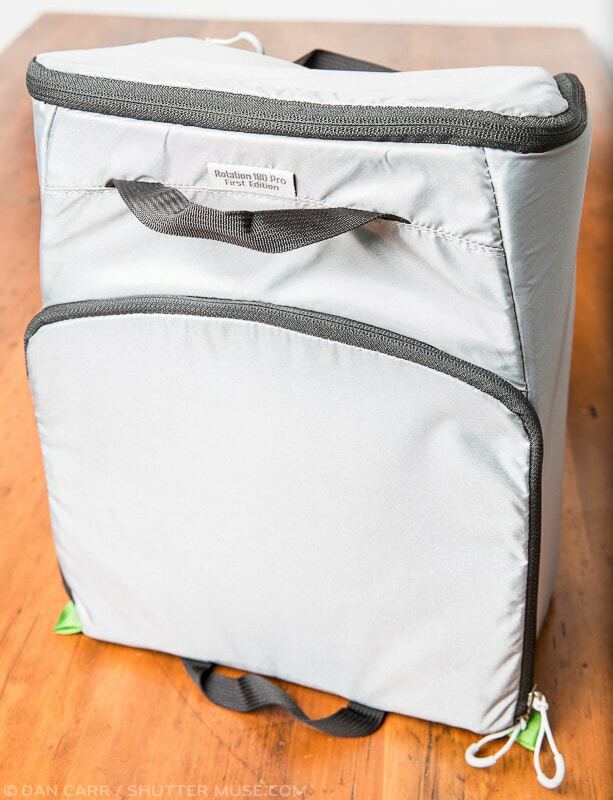 The exterior walls of the nylon case are relatively thinly padded compared to some other bags but I think it forms just the right amount of protection without becoming too heavy or bulky. On the inside of the insert you’ll find a little thicker padding for the main divider and then some thinner ones to split up the lenses. 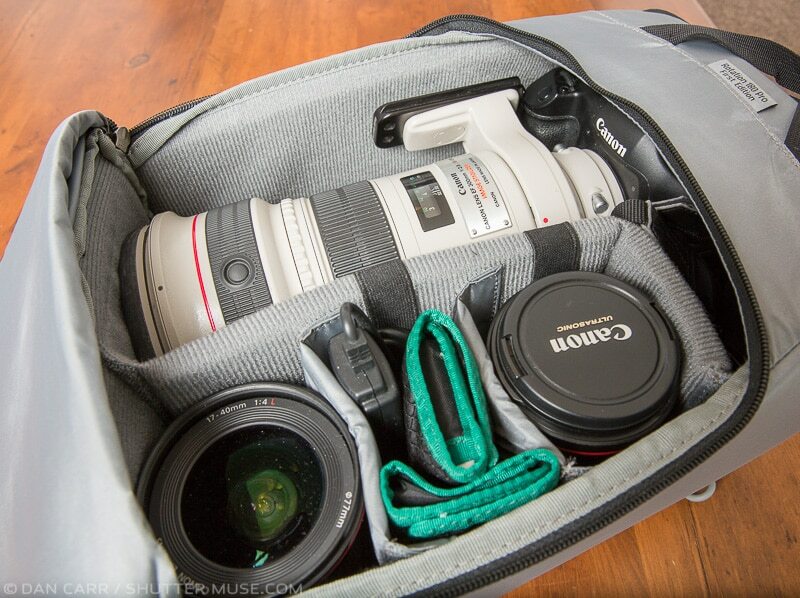 It offers bump protection to your gear but not a whole lot of drop or impact protection. Think of it more like an organizational insert. 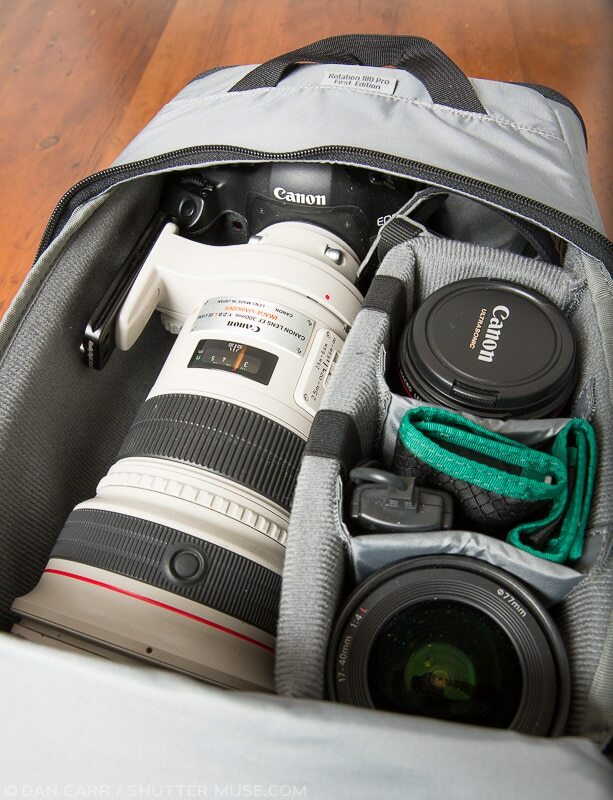 There’s ample room in the insert for a camera body and 5-6 average sized lenses. If you are using a 70-200, it’ll fit attached to a body on the left side. 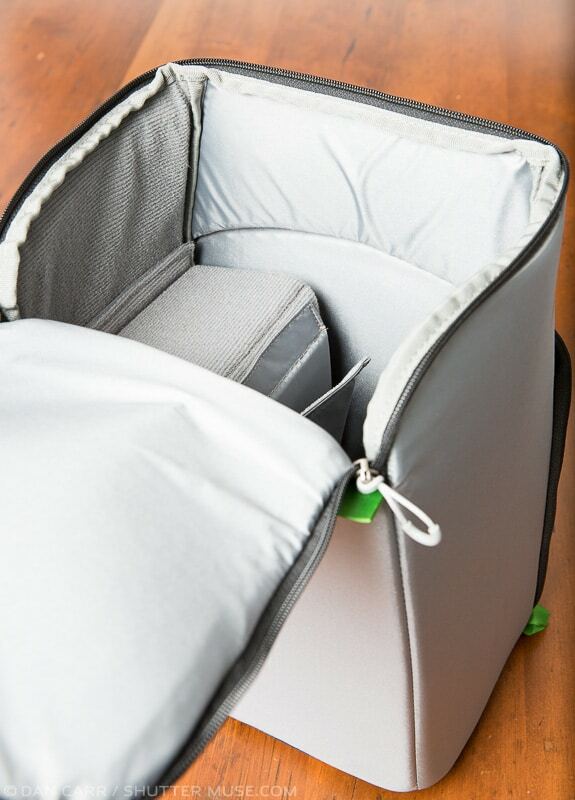 The top opening allows you to retrieve your gear from the top zipper on the Rotation 180 instead of just the back panel. 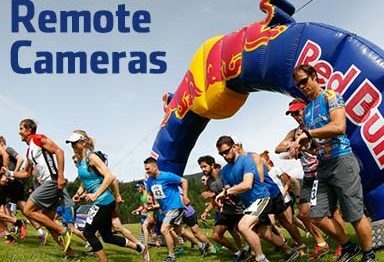 This allows you easy access to a lens that’s already attached to a body, and the padding in the insert supports that camera above the other lenses in the insert while you’re wearing the pack. As you can see in this photo, the insert is wide enough on the top end to fit pro-sized bodies like a Nikon D4, or in this case a a Canon 1-Series body. Here you can see how this fits in the Rotation 180. It takes up all of the room in the top section of the bag. 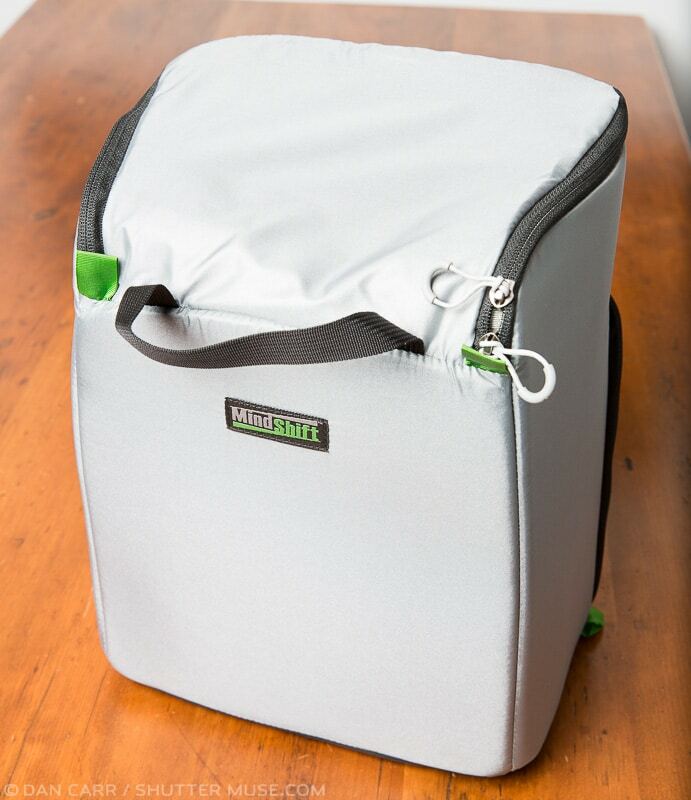 If you need additional room you can use the accessory Top Pocket to add some more volume for food or clothing which is my typical usage. Owners of a 300mm f2.8 will be pleased to know that you can actually it it in the insert when it’s still attached to a camera body! As you can see, there was still room left over for a few more lenses as well. The insert is nicely built, as you’d expect from the folks at Mindshift, so really the question is whether you need this for your Rotation 180 or not? I’ve used this backpack for more than six months now. It’s been with me all over Asia for some landscape and travel work, and I’ve also used it for wildlife photography in British Columbia, carting around my Canon 200-400. I’ve also carried flash packs up mountains in it and and skied down a bunch of mountains with it in the winter. I would say that for me, I have used the padded insert roughly 50% of the time I have used the bag. In my book, that makes it a necessity. The times when I did not use it, I filled the top half of the Rotation 180 with other gear such as extra clothing, food or safety gear. My 200-400 only fits in the pack when the insert is not used so again when that lens is in the bag, the insert it not. Now even when the insert is not being used in the bag though, I’m using it in my office as storage. 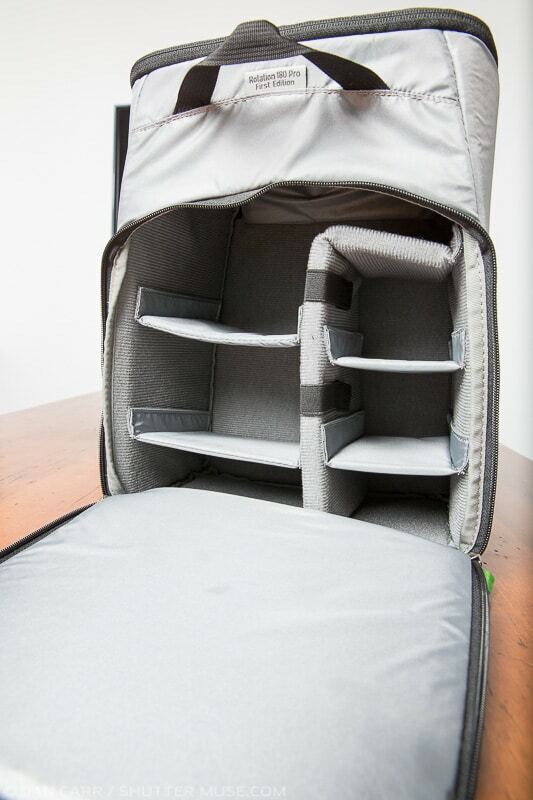 It works very well as shelf storage for the rest of my lenses and then when I need to take more gear with me, most of it is already packed and ready and I just drop the insert into the pack. 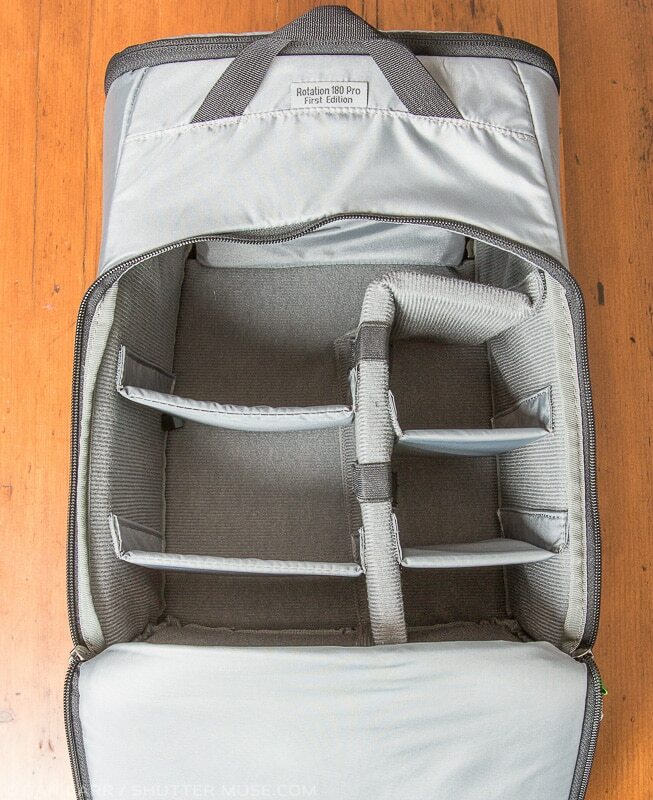 Much like the Mindshift Lens Switch Case (review), what I like about the padded insert is the minimalist approach to its design in terms of bulk and weight of materials. I have some other inserts from F-Stop Gear and they are more than twice as heavy as the Mindshift one for the same volume. That’s needless weigh when you’re traveling and hiking! This insert only weighs 15 ounces (425 grams). On my recent Asian adventure I simply used the insert to organize my gear in my main duffel bag. I didn’t need it in the backpack, but it worked perfectly to organize all the other little things rattling around my Arcteryx Duffel. I’d rate this as a must-have accessory for the Rotation 180. 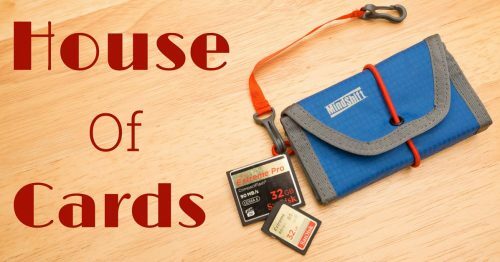 Hi, I read your reviews of the various F-stop bags and MindShift Gear Rotation 180 Pro insert. 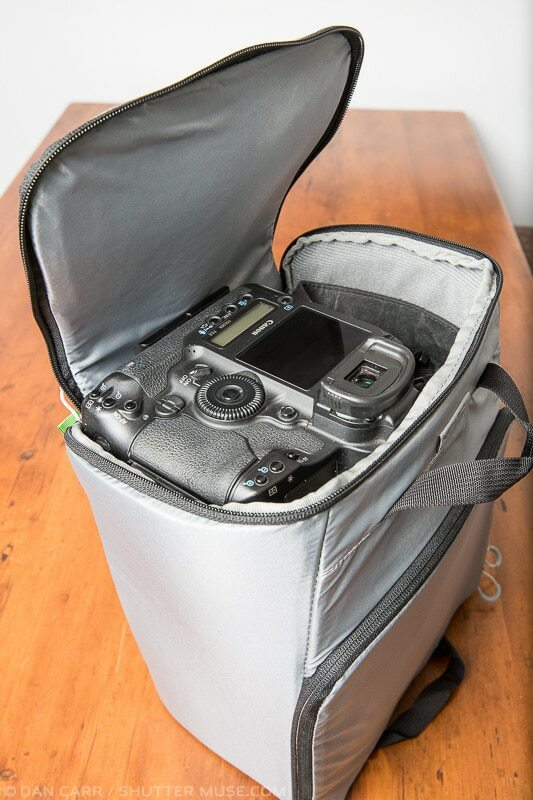 Since you have experimented & reviewed both systems, do you know whether the Mindshift Rotation Pro camera insert can fit inside the F-stop bags (whether Satori, Loka, Tilopa) & enable back access much like F-stop’s own ICUs? 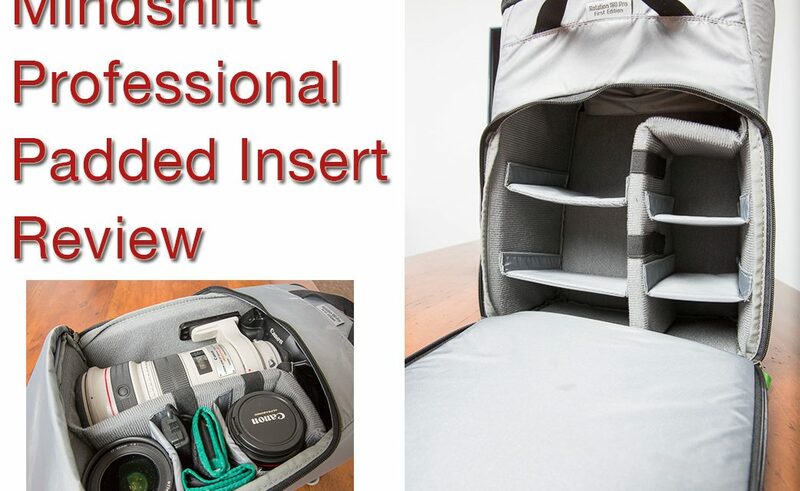 The Mindshift Pro insert is one of the few camera inserts apart from F-stop’s ICUs that has the back access opening (most other inserts are accessed from the top only) that looks kind of similar to the Fstop ICU. Have you ever tried it? I am asking because the Fstop ICUs are pretty difficult to get with a long waiting time. Would appreciate your comments on this. Thanks for your very helpful reviews & photography tips. Hey! I’ve never actually tried that, but all these bags tend to have very similar widths so I’d imagine it would work. If you check the specifications on both websites, I’m sure you can get exact measurements and compare them. It’s a shame that F-stop stuff is continually hard to get hold of. I can’t tell you how many questions I’ve fielded over the years from people looking for alternative solutions for various things because they can’t get the F-Stop stuff.